In New York-born Charles Finch’s fifth historical whodunit (after A STRANGER IN MAYFAIR), former detective and now freshman member of Parliament Charles Lenox is dispatched in 1873 on a covert mission to France’s newly opened Suez Canal, aboard HMS Lucy. Several British spies have been killed on French soil, war seems imminent, and control of the canal is in Queen Victoria’s best interest. Lenox is called away from his later-in-life wife, Lady Jane Grey, who now expects their first child. 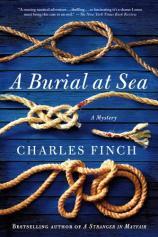 "[A BURIAL AT SEA is a] richly researched education of Victorian maritime tradition." On the first night out, Lieutenant Thomas St. James Halifax is murdered, “cut open straight down the middle from his throat to his stomach.” Captain Jacob Martin summons Lenox to investigate, waking him not only from sleep but from the dormant desire to return to sleuthing. Astoundingly obvious clues that implicate various officers found at and in the body vanish from Lenox’s cabin. Even his portly steward, “a Scot called McEwan,” falls under suspicion. Clues abound, and there is a virtual sea of red herrings. Unraveling a murder mystery in the claustrophobic confines of a small ship is a throwback to Agatha Christie’s MURDER ON THE ORIENT EXPRESS, here on a British naval vessel instead of a luxury train. “The problem was the preponderance of suspects,” with 220 aboard. Complicating matters is “that most dreaded movement...mutiny.” Lenox finds a bloody smudge on a note in his cabin, effectively stating The Lucy is ours. “Then there was the widespread illiteracy of the sailors. [F]ew sailors on the ship can write or read.” Lenox shifts his suspicion from crew to officers, not excluding Captain Martin. But Martin has a dead-on alibi. Predictably, Lenox faces death from those who would commit murder and mutiny. At age 42, he’s no longer in tip-top shape, and climbing the mizzenmast to investigate makes him aware of his age. With all the goings-on aboard the Lucy, Lenox’s original mission in Port Said, Egypt, becomes anticlimactic, but may be a clever ploy of the author for sequels that will keep Lenox embroiled in mysteries set in exotic locations. According to Finch, this richly researched education of Victorian maritime tradition “required perhaps more research than the previous four Lenox books combined.” He brilliantly sets up a slew of potential recurring characters, including nephew Teddy, son of his Parliamentary brother Sir Edmund and consort to Prime Minister Gladstone. Undoubtedly the ultimate of the Lenox series, this surefire “best sailor” docked on my Top Ten list for 2011.